Italian Mid-Century Modern console table or sofa table with two-tier design. 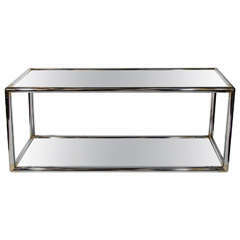 Comprised of tubular chrome frame with rounded brass corners, and fitted with mirrored tops. In the style of Romeo Rega. Very elegant two-tier console signed Jean Charles 10" from the floor to the lower tier. Brass and chrome circa 1965.